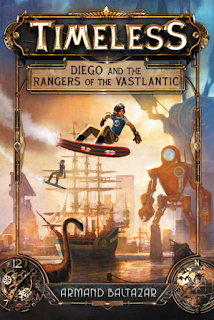 Armand Baltazar's Timeless: Diego and the Rangers of the Vastlantic is a vividly imaginative tale that covers so many great story points that in my opinion, it defies to be categorized into one genre. 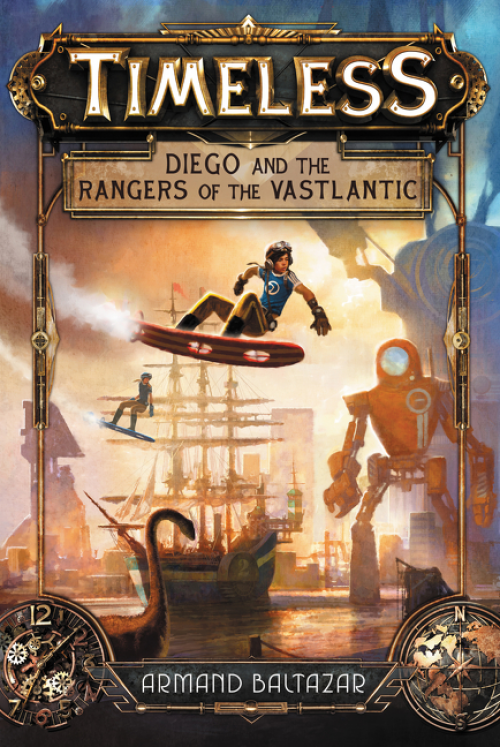 With elements of time travel mixed with robots, dinosaurs, steampunkery, and pirates, characters from the past, present, and future, this book has a little bit of everything. The action grabs you fairly quickly and never really lets up, yet it doesn't feel overly done. Baltazar keeps the pace exciting, but not at the expense of his characters' development. While it did seem that the kids went very quickly from not knowing one another and not necessarily liking one another to a fairly tight knit group, beyond that they seemed like fully fleshed out characters by the end of the book. The star of this book is the artwork. While the ARC provided black and white illustrations only, even these are breathtaking in their scope, and I can hardly wait to see what the full color package is going to look like. I'm sure it is going to be mesmerizing. Baltazar has created quite the unique piece of literature/art and I'm thoroughly looking forward to what his imagination cooks up in the future. I received a printed ARC of this book from the publisher for a fair and honest review.